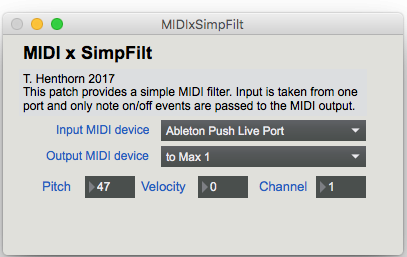 The MIDxSimpFilt patch provides a simple MIDI filter. Input is taken from one port and only note on/off events are passed to the MIDI output. This can be useful where devices are sending MIDI data that you don’t want (e.g. a drum brain that continuously sends out CC data). Note that the “MIDI Solutions Event Processor” is a hardware MIDI device that does this (and much more).